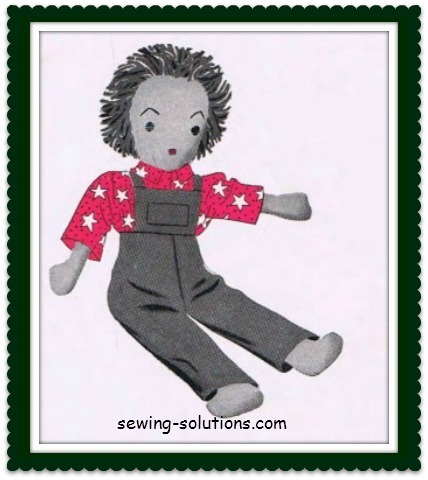 Free rag doll pattern is great for babies and toddlers. Great gifts for showers, birthdays and wonderful for charities. Doll in favorite Little Boy Clothes draw these pieces out on 1" graph paper. Fabric — scraps for clothes; Chadwick's Red Heart Knitting Worsted in yellow or brown for hair; J. & P. Coats or Clark's O.N.T. Six Strand Embroidery Floss—black and red for eyes and mouth. Collar-1 piece, 1" x 4". 1. On Head pieces, stitch slashes together like darts, right sides together. 2For Hair, cut piece of stiff paper 5" x 6". Wind yarn close together around 6" length of paper. Stitch through paper along 1 edge. Cut through loops at other end and remove paper. 3. Place stitched edge against top edge (right side) of 1 Head piece and stitch close to edge. 4. Stitch lower strands of Hair to Headpiece 1/2" from lower edge. Trim ends evenly. 5. Join each Head piece to a Body piece at neck. 6. Stitch raw edges of Leg and Arm pieces together, leaving straight ends open. Turn. Stuff tightly to within 1" of open end. Stitch raw edges together. 7. On right side of Body Back, baste Arms against sides at shoulders and Legs at bottom, raw edges together, and stitch. 8. Baste Front and Back together, right side facing. 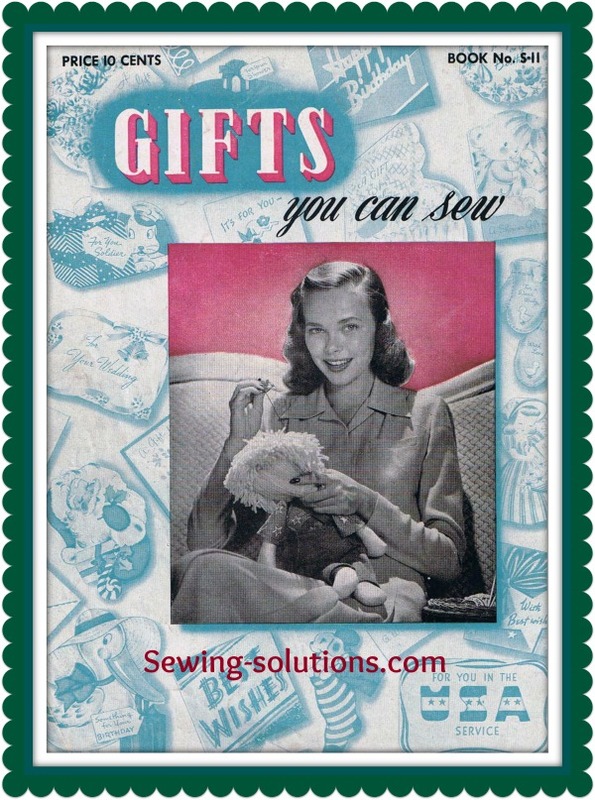 Stitch all around raw edges, leaving bottom open between Legs. Turn through opening and stuff. Overcast opening. 9. For front Hair, wind yarn around 5" width of a 5" x 8" paper. Stitch through center of paper. Cut loops, remove paper. 10. Tack yarn on stitching line to seam around Head. Trim ends. 1. Stitch Leg seams, then stitch both Legs together around crotch. 2. Make 1/2" hem at bottom of Legs and 1/4" at top of Overalls. 3. Make 1/4" hem all around Bib. 4. Turn under 1/4" all around Pocket and stitch to Bib. 5. Fold Straps in half, stitch 7" sides and 1 end together. Turn and stitch to top corners of Bib. 6. Stitch Bib to center front of Trousers. 7. Cross Straps and stitch to back of Trousers. 1. Stitch shoulder seams of Shirt Front and Back, and sew one 6" end of Sleeve to each shoulder (center of Sleeve on shoulder seam). Stitch Sleeve and underarm seam in one. Make 1/4" hem at bottom of Sleeve and at bottom of Shirt. 2. 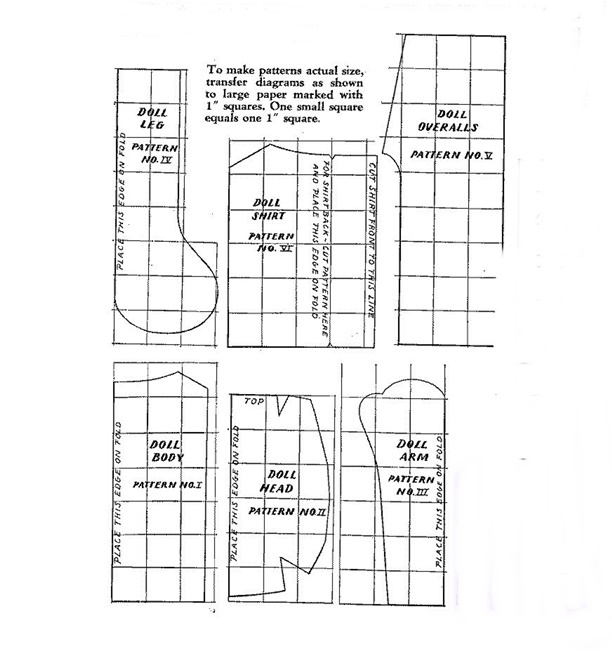 Fold Collar in half, stitch ends and turn. Match center of Collar to center back of Shirt on right side and stitch around Neck. 3. Fold front facing over right side of Shirt at notches and stitch over Collar. 4. Turn and edge stitch all around front edges and Collar. Make loop at 1 side of neck edge and sew button to other.